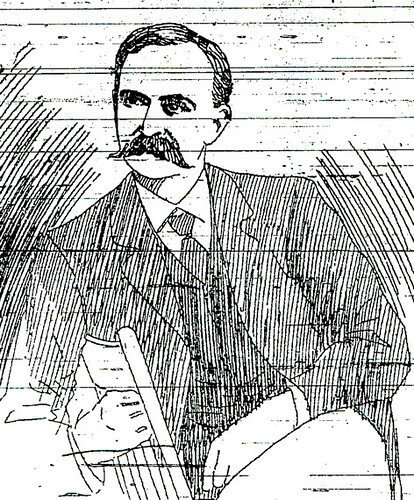 A sketch of Carson from a 1890 photograph. Local newspaper baron Alexander Washington “Kit” Carson was one of the most influential individuals in the early development of Joplin. While he was not a capitalist like Thomas Connor, Carson left his own indelible mark on the city he called home. The red-headed Carson was born near Cadis, Ohio, in 1842. During the Civil War, he served with Company C of the Forty-Third Ohio Volunteer Infantry. After the war ended, he headed west, and taught school at Marshfield, Missouri. Carson left Marshfield a few years later and arrived in Joplin where he began publishing the Joplin News-Herald in February, 1877. Years later Carson, a lifelong bachelor, was still living in his apartment located in the News-Herald building located on Fourth Street. He could often be seen sitting outside the building in a chair reading his old paper. Carson’s friend John Power was an early resident of Joplin and recalled both Carson and the glory days of Joplin’s journalism community in a newspaper article. 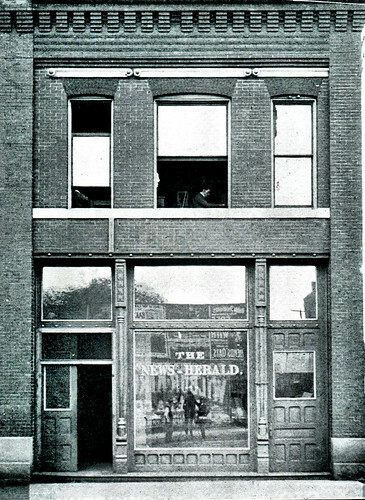 The Joplin Daily News Herald Office, circa 1902. Together with Columbus “Lum” Farrar, Carson founded the Joplin News-Herald, and soon became sole owner after Farrar found journalism to be hard work. Carson bought out Farrar’s interest in the paper and remained sole proprietor. He put in long hours as the News-Herald was the morning paper. Carson stayed up all night furnishing the copy, proof-reading, making up forms, and then printing the paper on an old Washington hand-crank printing press. By the time he sold the paper in 1888, the News-Herald had become “hard to kill” with a first rate printing press and loyal readership. After he sold the paper, he became known for his eccentric, yet gentle personality. On another occasion, Carson sold some pedigreed hens worth $2-$5 apiece to a woman for only 25 cents apiece, thinking that she would use them for eggs. He stopped by the woman’s house a few days later only to discover that she had eaten all of the chickens. Carson, in tears, remarked that had he known she was going to eat them he would have kept them, as he had hand-raised the chicks after they were orphaned. He also had a soft heart when it came to his friends. Power recalled on one occasion when the two were out in Carson’s buggy and stopped to visit one of Carson’s old friends. The men talked briefly and then Carson pulled away, remarking that his friend’s coal bin was empty. Carson’s next act was to order a ton of coal and have it delivered to his friend’s residence. And peculiar he was. In his will, A.W. Carson specified that $1,000 of his money be spent on the dissemination of Mark Twain’s “How to Be a Gentleman.” The only problem was is that no such work existed. 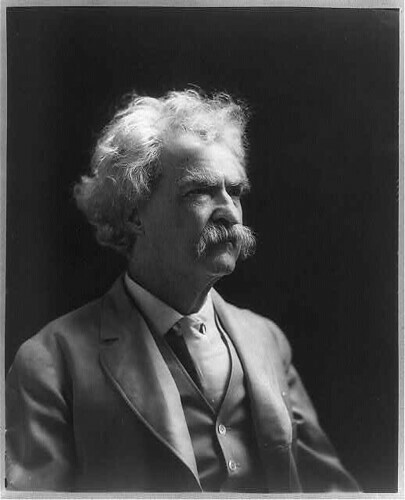 Mark Twain, whose non-existing idea of a gentleman was the focus of Carson's will. Library of Congress. As for A.W. Carson, he left behind many friends who were faced with one last peculiar act of an eccentric man who did much to contribute to the success of Joplin. I like how you can see the faint reflection of the photographer and his two assistants in the window of the Joplin News-Herald. This page took 0.402 seconds of computer labor to produce.